There are 2 things in life which we can't avoid: Death & Taxes. Yours Truly, Kris got called to be tax audited for the 1st time after so many years working as an employee. I read in a study that LHDN , our Lembaga Hasil Dalam Negeri has been very aggressive over the years to conduct extensive tax audits on all tax-payers. This is comes as not a surprise as you see a trend that the amount of tax collected year to year has been a rising trend. I am not against paying taxes. It is a duty as a citizen. However, I don't think many are so "lucky" yet to receive the call for a tax audit. 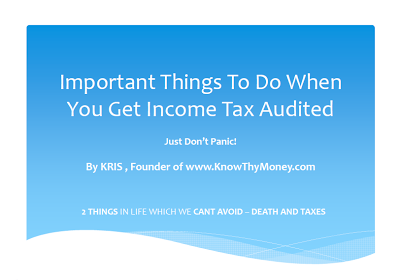 So, I came out with an ebook on "Important Things To Do When You Get Income Tax Audited" based on my own experience and examples, so that it can help fellow tax-paying Malaysian. Well, this is the 1st time, I came out with an e-book because the content i want to put into is way too long to be put effectively into a blog post. Furthermore, I can write with less constraint on a subscription only newsletter since distribution is limited to those that are interested. And since my blog is open to public, it might get out of hand if certain sensitive or financial insider tips/tricks are exposed. Those that have been following my blog for the past 6 years, will notice that I like discover the financial tricks that people use. I am that sort of guys that like to figure out how magician's perform their trick. Having said that, you can get only this ebook if you signed up as part of my newsletter subscription members. I call this subscription as "KnowThyMoney's MoneyIdeas Newsletter". It is FREE to join. I repeat again, FREE FREE FREE. Here is the link: They are all the same. The tab above my website. P.S I did some testing, the system will need to take like 1-2 hours even though I set it to send immediately. So be patient, and also check your junk/spam folder just in case your email gets overzealous. Why Signed Up To KnowThyMoney's MoneyIdeas? Get only the E-book? So what? I created the MoneyIdea Newsletter as an avenue to share future postings, e-books that is not so suitable to be broad-casted on a normal blog posting. Besides that you can get might exclusive knowledge on financial related events, news, etc that I may know of. And some of the financial trick/tips that we can use. And I also get to play experiment with the newsletter subscription engine :D . I am very new to this, so do allow some lenience to me, Okey? I promise not to spam you , and you can always un-subscribe to my KnowThyMoney MoneyIdeas Newsletter anytime. See below news article Expect more frequent TAX Audits. IPOH, Dec 29 2012 – The Inland Revenue Board (LHDN)’s tax collections hit RM124.69 billion as of yesterday, surpassing the target set by the Finance Ministry for this year. Second Finance Minister Datuk Seri Ahmad Husni Hanadzlah said the collections exceeded both the original projection of RM109.09 billion as well as the ministry’s revised projection of RM123.82 billion. “LHDN had succeeded in going past the government’s projection. The tax collection increased by 13.76 per cent compared with RM109.61 billion in 2011. The collection in 2011 was also an increase by 26.72 per cent compared with the RM86.49 billion made in 2010,” he told reporters here today. He said the excellent performance from LHDN was supported by several strategies including the Key Performance Index (KPI) in 10 tax activities which covered revenue collection, uncollected account, efficiency in collection costs, external audit, repayments, investigations and LHDN’s electronic services as well as training for officers and staff, among others. There had been regular monitoring as well by the KPI Monitoring Committee to ensure that the targets were met with, he said. In terms of enforcement, the agency also expanded its auditing action and concentrated on high impact cases and had successfully solved 1.89 million cases involving an amount of RM2.94 billion and also other high profile cases coming to RM653 million in collections. Ahmad Husni, who is also Member Parliament for Tambun, said other improvements and enhancements in the provision of services to tax payers such as the e-Filing, e-Register, and e-Payment services as well as prompt repayments also contributed to efficiency in tax collections. Last March, Prime Minister Datuk Seri Najib Tun Razak had said that LHDN’s success in achieving a 27 per cent increase in the tax collections for 2011 compared with 2010 was an extraordinary achievement. I wrote an API to block such emails in the subscriber system..haha.. I am a honest tax paying citizen & employee :D Hehehe..
Just subscribed! and I haven't received any call yet! Damn, you are one lucky Dog..lol. But the truth is LHDN is intensifying audits in an aggressive manner. They have KPIs in this area of interest.